We have made cheese 33 times in the last 2 months, which is a lot of cheese making for a small cheese maker like us. Not only does this put pressure on our cold room space, which we have massively outgrown and has become a big problem, but it increases the risk of microbiological and even phage contamination. All dairies have strict house keeping schedules that covers all aspects of cleaning. We have a schedule glued to the wall which shows each time (date) the pasteuriser has been cleaned with caustic (every time it has been used) and when it has also been cleaned with nitric. 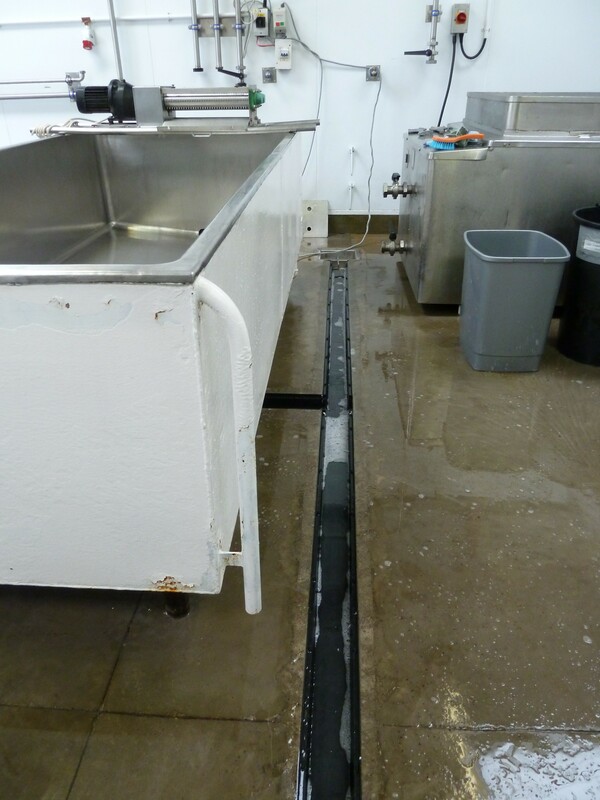 It is so important to rinse out these chemicals before pasteurising as any residue could cause problems with your make. Then we have schedules at the foot of each make sheet that we tick to show that we cleaned (degreased) and sterilised (sanitised) all the utensils, that the vats have been cleaned and sanitised; this schedule covers not only all equipment we use but things like cleaning any splash marks from walls etc. We also have cleaning schedules for our wholesale and waxing area, the washroom and kitchen/office area. It is the job of the EHO to check that these are robust enough in the first place and that you are adhering to them. All of your cleaning schedules should be covered by your HACCPs (food safety plans.) Yes, it sounds like a whole load more ticks to put in place, and the chances are you do it all anyway as a matter of course – no one wants to make cheese in a dirty dairy, but I feel it is one of those things you have to show you are doing as well as saying you do it. true, anyone can tick boxes, but if you test finished cheese, you will soon know if your cleaning regime is good enough, if not, you will get positive lab results. We test one cheese out of every batch we make, by taking a cross section from the middle of the cheese, vac packing it and sending it to the lab. 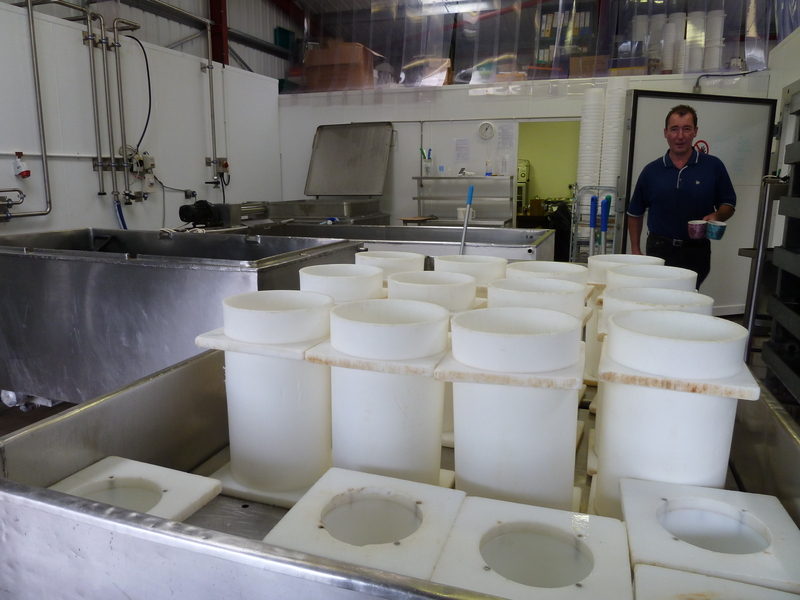 We use NWL Labs in Poulton-le-Fylde who are lead by Danny who (bad news for us) is moving on, to so an MSc in something terribly technical at Manchester Uni (good for him, he then plans to do a PhD – brilliant!) We test for Staph A, Listeria, E Coli and Salmonella. If, like us, you have cleaning schedules that cover all aspects of your business, and you test the finished cheese for unwanted pathogens, then this final lab test should show if your cleaning is working. Let’s be honest, all dairies at some stage in their life do get positive results. We had a positive about 18 months ago, but, touch wood, this has not happened since. Danny at our labs once praised us as having the lowest rate of positive test results amongst all his cheese making clients. But let’s not get complacent, negative results don’t just happen, you really do have to be extremely vigilant, hence our deep clean. If you want to belt and braces your cleaning, I suggest you get Listeria testing kits – your lab will have these; I can’t remember how much they cost, but I seem to recall, they are not that expensive and the upside is that you can take many swabs. This comprises a plastic pot containing a wide sponge on a stick or they can be a stick swab. You can take many swabs using the sponge, on both sides, put it back in its pot, lid back on and send it off to your lab. 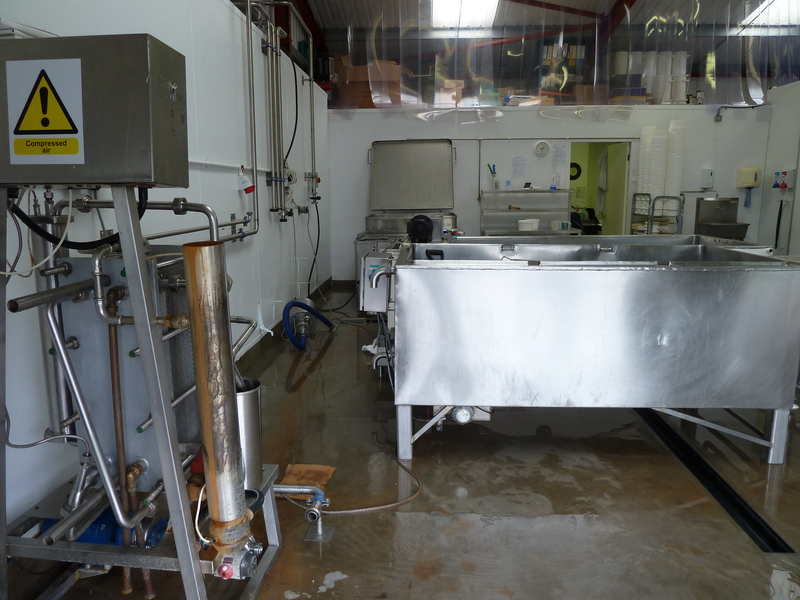 Lydia did the test for this year’s BRC and she managed to swab 40 different places using 5 swabs, from door handles, valve handles, inside vats, sink plug holes, our hands, sleeves of our whites, the press, the drains, all over the place, not just the dairy. Of course, if one swab comes back positive and you have swabbed multiple areas, you will not know which particular item has thrown up a positive result. My view on this is that if any swab comes back positive, you need to do a deep clean then re-test anyway. Also, you have the option of being completely honest with yourselves and swab just before a cheese make, when you are assuming that everything is clean or you can clean down and swab. I made sure that Lydia took the 40 swabs first thing in the morning, before a cheese make when the cleaning had finished the day before – so no cleaning and then swabbing – this is cheating! but it is up to you. 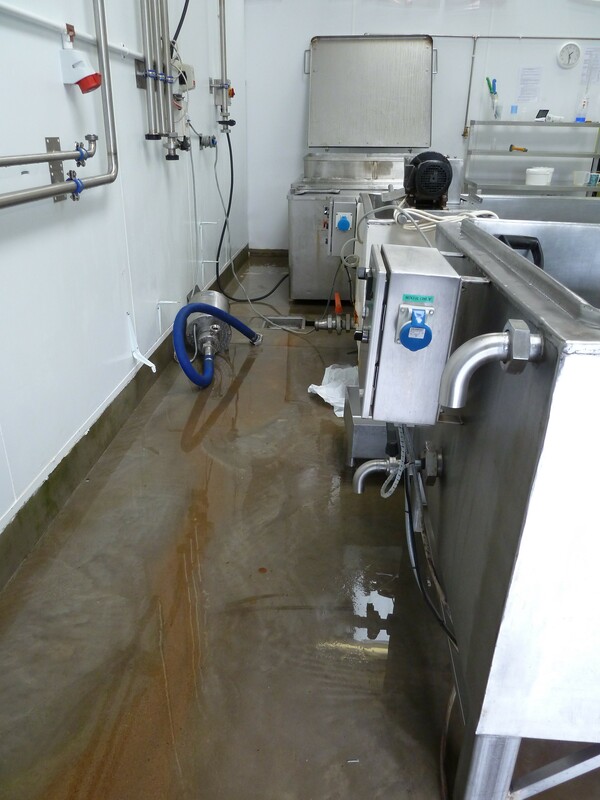 than wait another month or so to do a deep clean, we felt it might be a good idea to do a deep clean of the dairy sooner rather than later and Friday seemed like a good day to do it! We normally have a deep clean every quarter or so, we felt it would be wise to keep any unwanted bacteria at bay, before anything bad happened. We cleaned the walls and doors down with a solution of hypochlorite, scrubbed the press to within an inch of its life and cleaned the drains down. We clean the drains every week anyway, but it doesn’t hurt to keep on top of it. Then we scrubbed the floor and washed all our equipment, vats, curd cutters, wash tank, you name it in a mild solution of hypo. 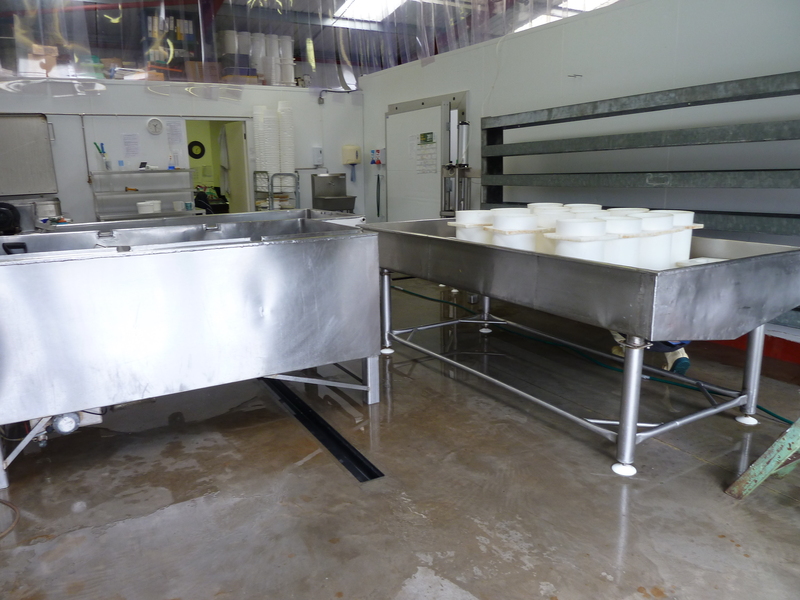 We re-scrubbed both vats with degreaser, even though we had already done it – there was no tide mark, but hey, let’s have another go and at the end of the day, after rinsing the vat off, we put all our cheese moulds in the vat which we also filled with a mild solution of hypo to soak over the weekend. Before we go home today, we will spray the air with a 2% solution of hypo and scarper – it is evil stuff! On Monday, we will swill it all out and rinse everything and we will be able to start anew for Tuesday’s goat make. We are making goat on Monday and Tuesday, Cow on Wednesday and Sheep on Friday. I would love to know what other cheese makers do for their deep clean.